This paper addresses the potential information leakages of a fingerprint comparison algorithm embedded as a hardware implementation. Such solution aims at comparing a reference fingerprint with a freshly acquired one completely inside an embedded system (e.g. ASIC, smart card, FPGA). The same way as for cryptographic operations within a cryptoprocessor, we consider the reference fingerprint template as a sensitive data that one may try to retrieve by attacking the chip. 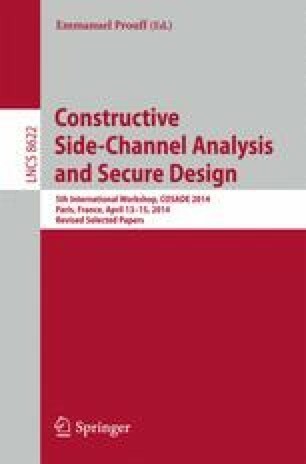 On one hand, we show that we can find relevant information by the means of Side Channel Analysis (SCA) that may help to retrieve the reference fingerprint. On the other hand, we illustrate that reconstructing the fingerprint remains not trivial and we give some simple countermeasures to protect further the comparison algorithm. This work has been partially funded by the French ANR project BMOS and by the European FP7 BEAT project (SEC-2011-284989). The authors would like to thank the other BMOS partners, especially Thibault Porteboeuf from Secure-IC, for their help on the FPGA prototype.